The Jerusalem of the Aegean! 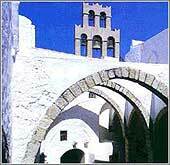 Called the Jerusalem of the Aegean, Patmos is an island of ascetic austerity. Its terrain matches the mood, made of rock and bays. 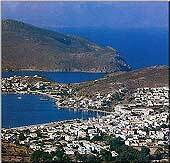 Patmos is of volcanic origin and has a much indented coastline. Many believe that is the most impressive island in terms of natural beauty. The tourist infrastructure, the healthy mild climate, the pure atmosphere, the laced shores, the very beautiful gulfs, the crystal clear sea, the surrounding islets and the sites, promise unforgettable vacations. Above the port can be seen the hill on which the ancient acropolis was built. From Skala the chief place of the island, Patmos or Chora, can be reached either on a new road or on the old mule track. Half way there, on the left, is the Monastery of the Apocalypse, with the cave in which tradition has it that John wrote the Book of Revelation. The iconostasis of the right-hand chapel, which is built into the cave, depicts John's visions and on the floor and wall are marked the spots where he rested, where he heard "a great voice, as of a trumpet" and where he wrote down his visions. Immediately above the monastery can be seen the ruins of the 18th century Patmian School and above this again the terraced buildings of the modern Theological College which continues the tradition. The main center of tourist interest on the island is the quiet little town of Chora, with its whitewashed houses, its monasteries, churches and chapels and above all the Monastery of St. John the Theologian, a house directly subordinate to the Oecumenical Patriarchate of Constantinople, which looms over the town with its massive 15th century walls and 17th century battlements. 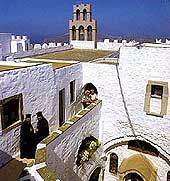 After seeing all the treasures of the monastery visitors should not miss going up on the roof terraces of the monastery to enjoy the superb views of Patmos and the surrounding islands.